Snippets of Jack: "Seagulls . . . Nesting"
"Seagulls . . . Nesting"
Incase you were not aware, on October 19, 2012 the Pirates of the Caribbean ride in Walt Disney World in Orlando, Florida added as part of the attraction the mermaids from The Pirates of the Caribbean: On Stranger Tides. They have projections swimming of mermaids throughout the water and even have a mermain skeleton! How creepy. Unfortunately I haven't seen the new addtions. I've visited Disney World in Orlando before and went on the PotC ride but the had not added the mermaids yet. I more often go to Disney Land in Aneheim, California when I visit California each year. Hopefully they will make this great addtion there too. 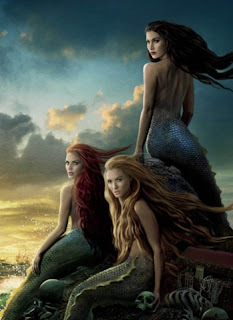 So in honor of thew new revisions, I thought I would make a post all about the hunt for mermaids! These lovely creatures absolutely terrify all the sailors, of every single party. The thought of the mermaids totally freaks out Barbossa's crew of the HMS Providence. Barbossa: "What do the men fear? Say it. Speak the words." Theodore Groves: "White Cap Bay." Gibbs, who is serving as the crew's navigator, discusses the topic with Barbossa, the captain. Barbossa: "Aye, Whitecap Bay! Every worthless seaman fears the name, and rightly so, though few know why or dare to ask." Gibbs: "Be the stories true?" Barbossa: "Say what robs you of your staunch heart Gibbs, or forever leave it to the whiter fields of fancy." Gibbs: "...Mermaids, Captain?" Barbossa: "Aye. Mermaids. Sea ghouls, devilfish, dreadful in hunger for flesh of man. Mermaid waters, that be our path. Cling to your soul, Gibbs, as mermaids be given to take the rest, to the bone." It sounds like quite the dangerous situation when you're being told to cling to your soul. Barbossa is always so kind and gentle, especially when it comes to fear. He pretty much tells the whole Royal Navy to get over it. Barbossa: "Gentlemen. I shall not ask any more than of any men than what that man can deliver, but I do ask this: are we not King's men?" Crew: "....Aye!" Barbossa: "On the king's mission?" Crew: "....Aye!" Barbossa: "I did not note any fear in the eyes of the Spanish as they passed us by. Are we not King's men?" Crew: "Aye!" Barbossa: "Aye! Hands aloft, and bear away. Stave on a head to Whitecap Bay!" Hey look, that rhymes. I'm telling, all the pirates probably have a night job as poets. As it turns out, the crew really did have something to be terrified of, as most of them ended their journey at White Cap Bay. But a few of them were not on the ship during the attack, but on shore looking at the mess the crew of the Queen Anne's Revenge made to capture Syrena, the mermaid. Barbossa, being the honoring gentleman we all know he is, pokes a dead mermaid's tail with his foot. Crew member: "Lord, is that . . .?" Gibbs: "Mermaid. Give up this madness now." Barbossa: "I cannot. Ever walk on the beach, look back and see your footsteps in the sand? It's like that, except the footsteps lie before me." Quite the poetic simile, Captain. Crew member: "Footstep, actually." Hahaha, I'm sorry but that was so snarky it was funny. Groves: "Whitecap Bay, Sir. We must hasten." They start to hear terrible shrieking. They turn around to their ship, to find that the mermaids are attacking it, probably eating the crew. I guess their not going back there. Barbossa, as usual, shows no sympathy for his men being killed. Baarbossa: "We travel by foot. Gibbs, I require a heading." Groves: "But, sir, the men." Barbossa: "They be dead already." Groves: "They don't sound dead." Dead men tell to tales, no shriek. Barbossa pulls out his pistol and points it at Groves. Barbossa: "Oh, is that so? Well, I hear nothing but seagulls nesting. What is it that you hear, Mr. Groves?" World's finest captain, I tell you. Groves, who looks like he wants to kill Barbossa (which he probably does), just says through gritted teeth: "Seagulls . . . nesting. Nothing more." So that is the story they will go back to England with. The whole crew died in a mermaid attack before their captain or anyone else could save them. Barbossa: "Heading, Gibbs?" Groves: "My God." They stand there idly watching the ship go down, but Barbossa has had enough of all this delay. Once again, he pulls out his gun but this time points under Gibbs' chin. Barbossa: "Your head or my heading. I'll have me one or t'other, I don't care which." Except that Barbossa would probably prefer the heading, because a dead Joshamee Gibbs wouldn't get him to the Fountain of Youth. Crew member: "All hands, forward!" The remainder of the crew begin to walk in Gibbs direction to the Fountain of Youth.